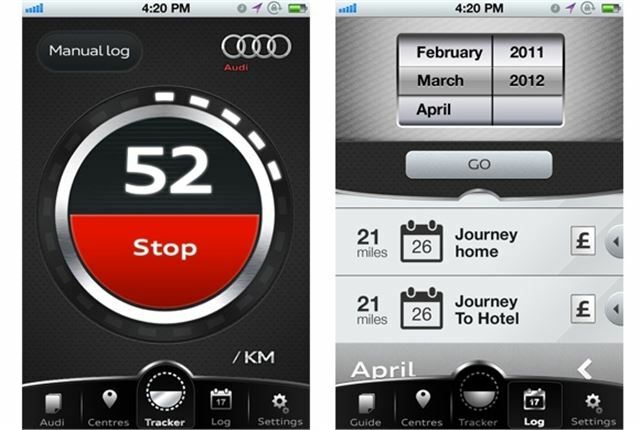 Audi has launched a free iPhone app for company car drivers that uses GPS to precisely calculate journeys and then calculates the expense depending on their mileage per mile rate. The easy to use app is available on iTunes now and lets users enter their mileage rate and then, using real time GPS, logs the length of the journey. At the end it displays exactly how much is owed in expenses and this can be transferred to a spreadsheet showing all the trips taken over a given period. As the exact route taken is tracked, regardless of diversions due to roadworks or congestion, the calculation provided is always absolutely accurate. You can then email this to yourself for expense claims. Drivers can even programme the app with journeys they take regularly and recall them from the journey log, or use the start/stop function each time they leave the office. As it's an Audi app, it will also point you in the direction of your nearest Audi Centre.